Midge is a term commonly applied to small Chironomids and Dipterans that trout feed on. They are a very important source of food for trout and can make up anywhere from 50% to 90% of a trout's diet in lakes. They are sometimes called gnats and look similar to mosquitoes but do not bite. Midges have two wings that lie in a flat “V” shape over the back when at rest. A nice parachute pattern by Shane Stalcup. 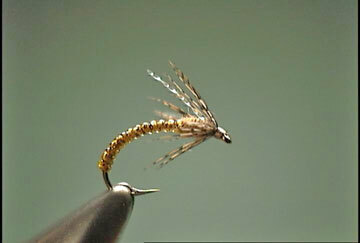 An emerger fly using deer hair. Fish this adult midge like a nymph. A good choice to use in the winter. An adult midge pattern with an small thin body. Midges are a big part of a trout's diet. The silver dubbing is made to look like a small gas bubble. The fly hangs down in the water just the right amount.